The FABIAN HFO is a new medical ventilator that was developed mainly for use with newborns and can accommodate children weighing up to 30 kg. It is equipped for ventilation modes CMV, SIMV, AC, PSV, and HFO and has VG, volume limit, and leak correction functions. A key feature is separate pressure setup for backup ventilation during apnoea in the CPAP + PSV mode. This article summarizes the specifications of the FABIAN HFO, looking mainly at benefits and caveats in the CPAP＋PSV Mode. Premature infants frequently develop apnoea even under artificial respiratory management, and apnoea is particularly prominent in the PSV mode, which utilizes spontaneous breathing. When an infant slips into apnoea during artificial respiratory management, the action of the respirator in the PSV mode will differ greatly depending on the model. ・PSV is a “2-trigger respiration mode” that responds to the triggers of inspiration and termination upon expiration. ・During apnoea, there is no inspiratory trigger, so forced (backup) ventilation is engaged. Unlike conventional medical ventilators, the FABIAN HFO can have separate settings for the maximum inspiratory pressure during backup ventilation and the PSV triggered by spontaneous breathing. Given application of the same maximum inspiratory pressure, it is generally possible to obtain a greater ventilation volume when there is triggering by spontaneous breathing than during apnoea. This means that pressure can become excessive during spontaneous breathing and inadequate during apnoea if ventilation occurs at the same pressure setting for apnoea and spontaneous breathing (Fig. 1). Respiratory regulation in premature infants differs from that in term infants in that the response of central chemoreceptors to CO2 is weak, the response of peripheral chemoreceptors to hypoxia is underdeveloped, and the cerebral cortex remains insufficiently awakened. Even if the partial pressure of CO2 in blood increases, there is not much response in the way of increasing ventilation volume, and the weak response of peripheral chemoreceptors to hypoxia is compounded by depression of the respiratory center (Fig. 2). 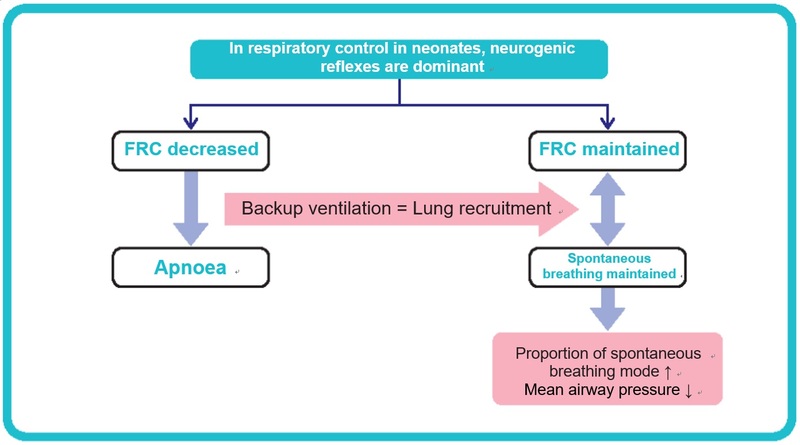 On the other hand, reflexive respiratory regulation is very dominant in premature infants and is characterized by a particularly strong Hering-Breuer reflex. This reflex contributes to the alternating pattern of the respiratory cycle, causing it to shift from inspiration to expiration when the alveoli swell and then shift back to inspiration when the alveoli contract. It is useful in maintaining functional residual capacity (FRC) in premature infants, where FRC is small and the lungs can easily collapse. Because reflexive respiratory regulation via the Hering-Breuer reflex is dominant in premature infants, the spontaneous respiration ratio increases when FRC is maintained, and spontaneous breathing then acts to maintain FRC in a virtuous circle. On the other hand, when FRC decreases, it causes hypoxaemia and apnoeic attacks, establishing a vicious circle. These virtuous and vicious circles are two sides of the same coin, and in respiratory control for premature infants, it is extremely important to maintain constant awareness of the functional residual capacity and appropriate lung recruitment (causing the alveoli to expand again). Because of these characteristics, termination may be engaged early if lung compliance decreases, particularly in PSV, and as a result, inspiratory time will be shorted. An inspiratory time that is too short will tend to have a deleterious effect on oxygenation. During apnoea, FRC decreases, and since it is highly possible that lung compliance will decrease as well, lung recruitment needs to occur appropriately at this point. However, many respirators allow termination to occur even during apnoea, which precludes recovery from apnoea, forcing us to set the ventilation pressure somewhat high (Fig. 3). 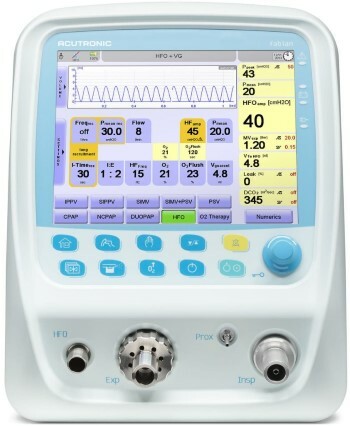 With a model like the FABIAN HFO, where different pressure values can be set for spontaneous breathing and backup ventilation, appropriate lung recruitment occurs when hypoxaemia and apnoeic attacks from a decrease in FRC establish a viscous circle, and the maintenance of FRC in turn maintains spontaneous respiration, making it possible to reduce the PSV pressure to the lower limit. The result is artificial respiratory management where an increased proportion of spontaneous breathing makes it possible to lower the mean airway pressure (Fig. 4). This point makes the CPAP + PSV Mode of the FABIAN HFO effective in preventing both volutrauma and atelectrauma, which can cause lung injury. Moreover, while the apnoea alarm time in conventional mechanical ventilators has been dependent on the expiratory time of backup ventilation, the apnoea time can be set independently in the CPAP + PSV Mode of the FABIAN HFO (Fig. 5). In the AC Mode, the triggering rate is known to decrease if the number of ventilation cycles is set too high. In both the AC mode and the PSV mode, all triggers come from spontaneous breathing, but if the number of cycles of backup ventilation is set too high, it is likely that the next forced ventilation will engage before spontaneous breathing can occur, and as a result, the triggering rate will decline. 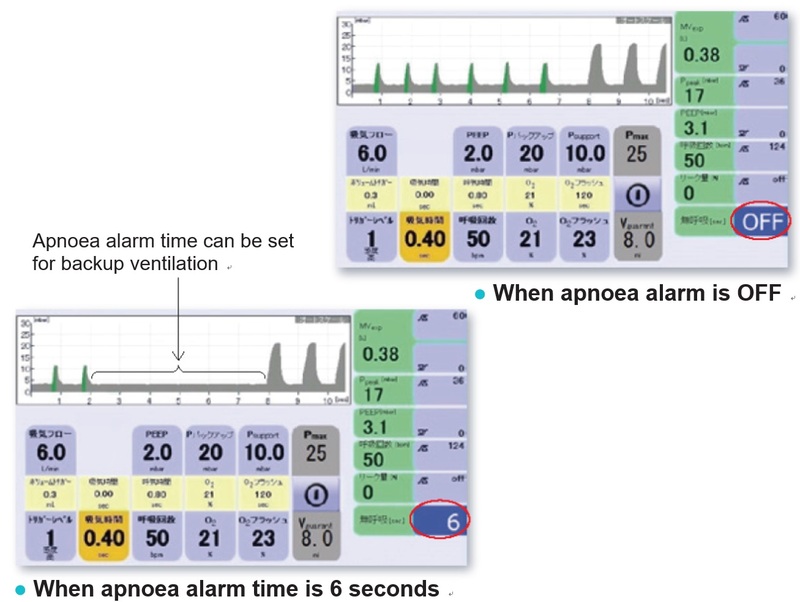 The ability to establish different settings for the apnoea time and backup ventilation expiratory time in the CPAP + PSV Mode can be expected to be effective in increasing the proportion of spontaneous breathing (Fig. 6). Since the backup ventilation setting is only for when apnoea occurs, setting it a little high compared to PSV pressure can be expected to result in a decrease in the mean airway pressure. Inspiratory time during manual breathing also differs depending on the model of ventilator. In the FABIAN HFO, pressure can be applied while the manual breathing button is being pressed, and the maximum inspiratory time can also be set (maximum time setting range of 2–30 seconds in manual breathing), allowing for a setting within the safe range. While it is undesirable to apply pressure for an excessive inspiratory time, this function comes in handy in cases where you do not want to go so far as to resort to bagging with a Jackson Rees. 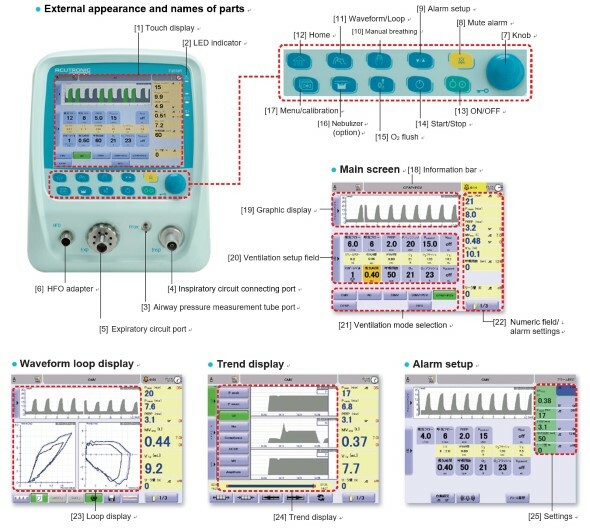 VG (volume guarantee) is a function that supplies inspiratory pressure according to the setting for VTe (exhaled tidal volume), automatically adjusting the pressure to reflect changes in the patient’s lung compliance, resistance, and respiratory movement, etc. Volume limit is a function that helps prevent overinflation of the lungs by adjusting the inspiratory pressure so that it does not exceed the set ventilation volume. The minimum ventilation volume is not guaranteed. This article has mainly discussed the usefulness of the CPAP + PSV Mode of the FABIAN HFO. In spite of its comparatively low price, the FABIAN HFO brings together an array of functions that until recently were available only in limited types of ventilators, and the overall impression is that innovative technology has been brought closer to hand. I look forward to the spread of artificial respiratory management that makes maximal use of the features of this unit.